Dr. DeFoore's Healing Anger Newsletter entitled "Assert Yourself With Healthy Anger"
Hi, learn about standing up for yourself in healthy ways. New Mobile Site! Please visit our site, AngerManagementResource.com using your smart phone, and check out the mobile version of the site. I would really appreciate your feedback -- just look for your favorite information, and see if you find it easy to navigate. Then let me know what you think! Thanks in advance. Visit defoore.com, Dr. DeFoore's other web site. Find lots of positive, upbeat perspectives to help you with your anger management, and sign up for the Goodfinding Newsletter...and you can read the current Goodfinding newsletter now!. Take a look at the diagram above. The "passive" arrow shows the thoughts and feelings staying inside your circle, no communication or action coming into the relationship. The "aggressive" arrow takes you into the other's circle...which is not your domain. 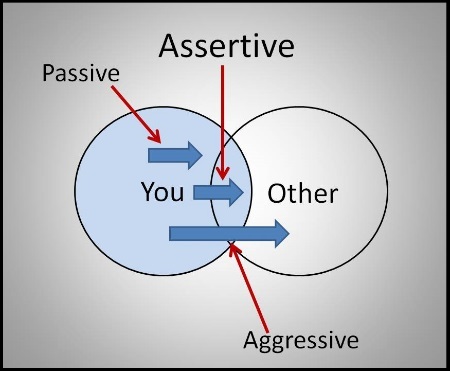 The "assertive" arrow is where your thoughts and feelings are being expressed respectfully into the relationship, not as an intrusion on the other's personal domain. "This is who I am and what I want." You're not claiming to be right or that others are wrong, you're just being clear about who you are and what you want. "This is where I'm going and what I'm choosing." Know your direction and your desired outcomes...have a vision for what you want and be clear about it. "This is where you stop and I start." In other words, you know your personal boundaries and where you stand. Assertiveness is about standing up and speaking out for what you believe, feel and want -- not standing up to someone else -- but it is standing up for yourself. When you're being assertive, you're claiming power within yourself and your domain, not power over other people. And that's a big difference. Make "I" statements, and avoid analyzing, criticizing or advising the other person. This keeps you powerful in your domain, and prevents the mistake of crossing the other's personal boundaries. 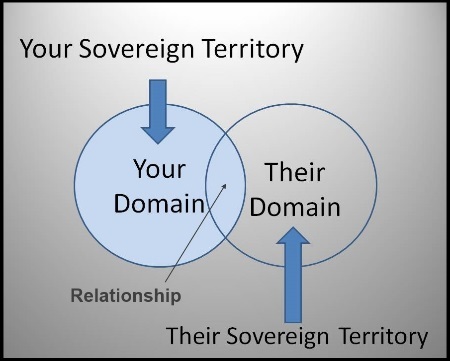 The diagram above emphasizes your sovereign domain, the sovereign domain of the other person, and the relationship. Your domain includes the relationship, but not the other person. Their domain includes the relationship, but not you. The first step to becoming sovereign in your domain and creating healthy anger is the same as the first step to becoming assertive in communication...heal your emotional wounds and learn to love yourself. Enthusiasm -- positive emotional energy making it easier for you to do what you choose to do. Determination -- the gritty gravel-in-the-gut feeling that nothing can stop you from reaching your goals. Self-discipline -- this is not a matter of pushing yourself to do the "right" things, it's a matter of being passionately focused on what you want and believe in. Focus and follow-through -- This is what just about everybody wants these days. Healthy anger and assertiveness will get you there! Focus: The Hidden Driver Of Excellence. This book will teach you everything you ever wanted to know about this important topic. Also learn more about assertiveness training, and how you can develop and practice these skills until they become second nature to you. Listen to Dr. DeFoore speak about how you can make your anger and all of your emotions work for you instead of against you. It is a matter of your health, by the way. Your mind, body and emotions are intimately connected, and if you're having anger, depression, and/or anxiety, you will definitely begin to have health problems, if you have not already. Don't let that happen to you! P.P.S. Did you know that I offer telephone (including Skype video phone) counseling around the world? That's right, from the comfort of your home, you can get professional counseling from me, Dr. William DeFoore. Contact us now to schedule a session! Comments? Ideas? Feedback? I'd love to hear from you. Just reply to this ezine and tell me what you think! If you have ideas for future Healing Anger Newsletter issues, I'm open to considering them. Here is your opportunity to get involved--I might even include your comments, story or link in a future issue of this ezine. Also, as I mentioned above I would very much like your testimonial or endorsement if you have purchased a product--or if you downloaded our free E-book! Don't forget! We want to hear your story, and when you submit it you get your own web page on the site! Take a look at the categories you can write in now. It's easy! This newsletter and the web site, AngerManagementResource.com were built and are maintained through a program called SiteBuildIt! It's the best way I know of to deal with the economic stress that so many are facing right now. Find out how you can start your own successful Internet business by watching these great videos about why so many people love SiteBuildIt! Would you like to lend a helping hand? If you have purchased a book, CD or audio download, I would very much like to hear what you thought of your product! With your permission, I will publish your comments on my web site to help other visitors like yourself learn more about the products. This would be a big help! Oh! By the way, did you get your free E-book? If so, after you've had a chance to read it and try some of the Anger Management Techniques, write to me and let me know what you think! Disclosure: William DeFoore is an authorized affiliate of Legacy Publishing Company, A.J. Novick Group, Inc., Think Right Now International, Inc., SiteSell, Inc. and the Institute of HeartMath.